Springfield, MO. 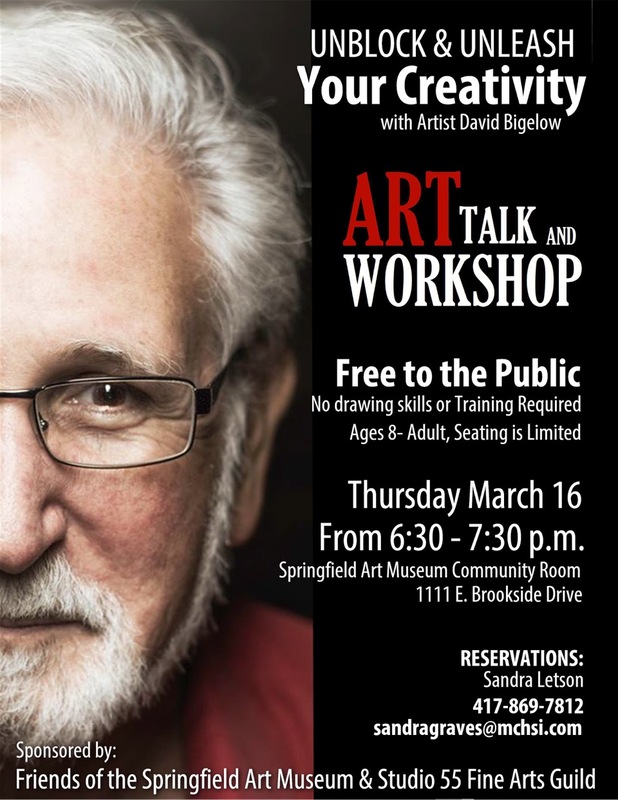 (March 8, 2017) - Friends of the Springfield Art Museum (FOSAM) and Studio 55 Fine Arts Guild are pleased to co-sponsor a hands-on workshop with artist David Bigelow on March 16, 2017 at 6:30 PM called "Unblock and Unleash Your Creativity." Bigelow will offer instruction on how to use drawing to help generate ideas allowing anyone, regardless of skill or training-level, to tap into visual thinking strategies. David Bigelow was born and raised in Michigan. He has a Bachelor of Fine Art in Printmaking and Painting, as well as a Master of Fine Arts in Printmaking and Drawing, both from the University of Michigan. He has taught at six different institutions and is currently teaching at Evangel University in Springfield, MO. Bigelow and his wife Marcia operate Bigelow Studios where he creates and sells his etchings. Bigelow will discuss his etchings and the importance of humor in his work and creative process. Bigelow notes, "Humor as content often appears when the familiar is seen in a new way. The goal is serious art with humorous content.” Bigelow is known for examining society from the outside-in, often using cliches and popular notions. This workshop is suitable for young people eight years of age, through adult. All materials will be provided. The evening is free and open to the public but space is limited, so reservations are required. Please email Sandra Letson, Vice President of FOSAM and Studio 55 Fine Arts Guild Past President at sandragraves@mchsi.com or call 417-869-7812 to reserve your seat. The Springfield Art Museum is located at 1111 E. Brookside Drive.